Danny (Colin Reid) the producer of the reality TV show The Gayborhood, wants to get the gang back together for a reunion season of the show long after the cast members (and former roommates) have all moved on. Well, some have moved further than others. 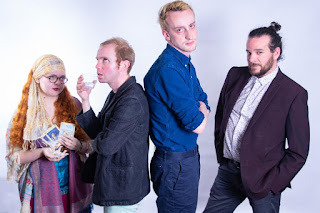 Jared (Zidane Lockhart), Devin (Emmert), and Molly (Emma Dalen) are all still rooming together, but their apartment building is going condo, and their meager incomes aren't enough to match the new sky-high rent. They either need a Hail Mary strategy to counteroffer against the mystery buyer of their building, or they’ll be evicted. Former fellow roommates Corey (Zach Christensen) and Jayden (Sam Michael) have moved further. Corey, an attention whore on social media, also keeps collecting followers of the physical variety in real life. Jayden is climbing the ladder of TV journalism. It would be nice if a shared cause could bring them all together, but their personality clashes, and hormones, keep getting in the way. Also in the ensemble are Michael Salazar and Mitchell Martin as The Sign Boys, keeping us posted on the passage of time in the play. There’s comedy to be mined from the notion of people who have a hard time living in the real world rather than on the TV screen with a camera following them around all the time. There’s comedy to be mined from stereotypes of the gay community that have their roots in truth. There’s comedy to be mined from the very real challenges caused by gentrification of formerly low income neighborhoods. But the lack of strong direction means the performances remain flat, and the jokes and satire don’t live up to their fullest potential. Emmert and company could use a person standing outside of the cast able to push the acting, the pacing and the development of the script to the next level. That’s the main thing right now that There Goes The Gayborhood is missing. That said, if you’re looking for funny and gay this Fringe, Gayborhood can still help you out in that department. Give it a look.